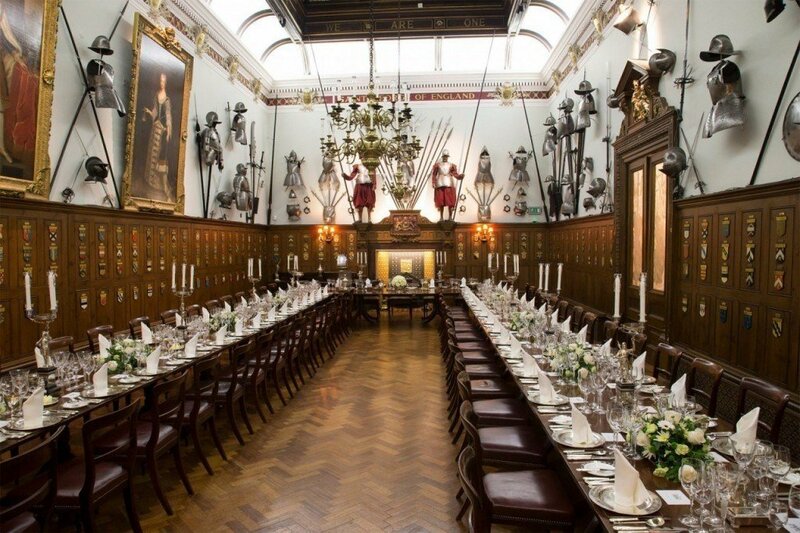 In the heart of the City, the Armourers’ Hall is a sophisticated venue steeped in history, and makes the ideal choice for events requiring an inspiring backdrop. 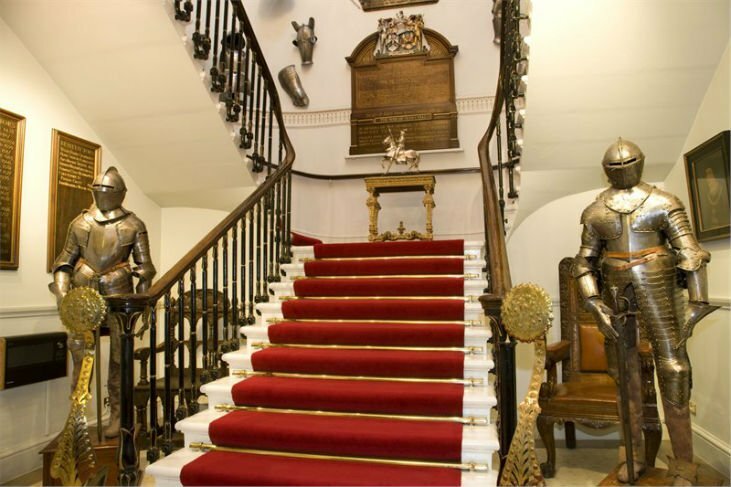 Steeped in history, the elaborate 19th Century building has a range of rooms available, each exhibiting splendid displays of 16th Century and 17th Century arms and armour. 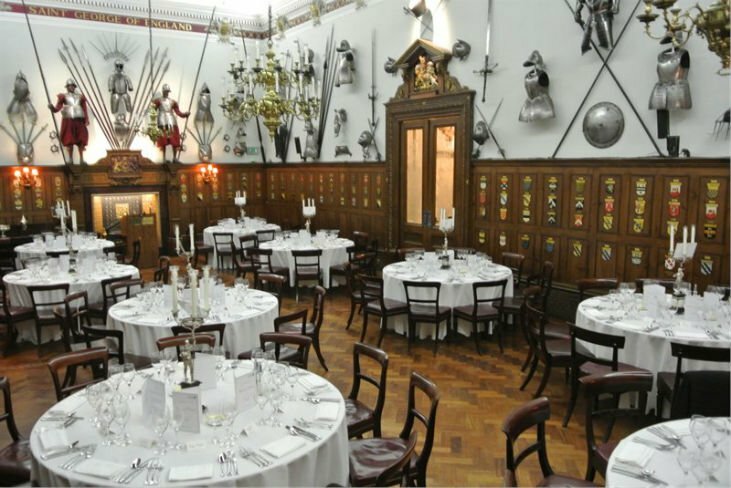 The Livery Dining Hall is the venue’s largest space, and can accommodate up to 100 seated dinner guests. Opulent decor includes three brass chandeliers, and a Men-at-Arms candelabra which set the scene for atmospheric events. The Livery Dining Hall also has a grand piano and public address system available. The Drawing Room, or ‘Gold Room’ as it is otherwise known, is another spectacular room that has a slightly smaller capacity of 50 guests for a seated dinner. Known as the ‘Gold Room’ due to its luxurious gold walls, the venue is hung with magnificent paintings of historic figures. The Armourers’ Court Room is an equally impressive space, and offers fine regency furnishings in rich mahogany. The Court Room is ideal for dinners, lunches or board meetings for up to 20 guests. Or, for smaller meetings or dinners, the Armourers’ and Brasiers’ Library is a quiet space in the heart of the building. The Armourers’ Company was founded in 1322 during the reign of King Edward II and has occupied the site upon which it sits today since 1346. The Armourers’ and Brasiers’ Companies (workers in brass and copper) had worked closely together and officially came together in 1708 when Queen Anne granted the Company’s present charter gibing the companies equal status. As Armourers to the Services, the Company played a special role in the defence of the City and still has connections with the Armed Forces to this day. The Armourers’ and Brasiers’ Company has always supported many charities but in 1979 an official grant making Charitable Trust was set up. One third of the Armourers’ and Brasiers’ Company’s grants go to charities focusing on homelessness and youth training. The other two thirds of grants go towards education in materials science. 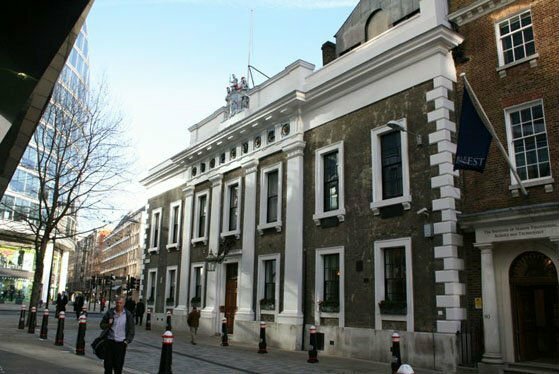 Armourers’ Hall has been the home of the Company since 1346. The Hall survived the fire of 1666 by yards and was also just saved from the Blitz by a mystery fireman who put out a fire in the Court Room before it had the chance to take hold.